by Chris Leonard, Analog Devices, Inc.
Part 1 of this article examined the challenges engineers encounter in implementing circuits for space level applications. Challenges related to the reliability, radiation effects and the ability of electronic devices to tolerate harsh environmental conditions encountered in a constantly changing environment of outer space. We also surveyed the space industry and applications driving growth in the business. In this second part we will explore the natural space radiation environment and the effects different types of radiation can have on electronic devices. We discuss current technology trends and their evolving interaction with the natural space radiation environment. We conclude the article by presenting Analog Devices’ efforts to provide solutions that support space level applications. The radiation effects on electronic devices is a primary concern for space level applications. Outside the protective cover of the Earth’s atmosphere, the solar system is filled with radiation. The natural space radiation environment can damage electronic devices and the effects range from a degradation in parametric performance to a complete functional failure. These effects can result in reduced mission lifetimes and major satellite system failures. The radiation environment close to Earth is divided into two categories: particles trapped in the Van Allen belts, and transient radiation. The particles trapped in the Van Allen belts are composed of energetic protons, electrons, and heavy ions. 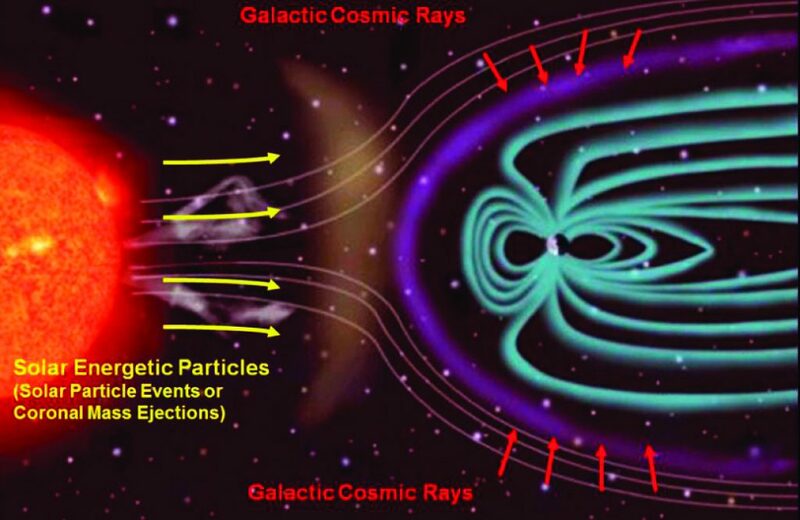 The transient radiation consists of galactic cosmic ray particles and particles from solar events (coronal mass ejections and solar flares). There are two primary ways that radiation can affect satellite electronics: total ionizing dose or (TID) and single event effects (SEEs). TID is a long-term failure mechanism versus SEE, which is an instantaneous failure mechanism. TID is a failure rate that can be described by a mean time to failure, whereas SEE is expressed in terms of a random failure rate. TID is a time dependent accumulated charge in a device over the mission lifetime. A particle passing through a transistor generates electron hole pairs in the thermal oxide. The accumulated charges can create leakage currents, degrade the gain of a device, affect timing characteristics and in some cases, cause complete functional failure. The total accumulated dose depends on the orbit and time. In LEO, the main source is from electrons and protons (inner belt) and in GEO, the primary source is from electrons (outer belt) and solar protons. It is worth noting that device shielding can be used to effectively reduce the accumulation of TID radiation. SEEs are caused by a single, high energy particle passing through a device and injecting a charge into the circuit. SEEs are typically divided into soft errors and hard errors. JEDEC defines soft errors as nondestructive functional errors induced by energetic ion strikes. Soft errors are a subset of SEEs and include single-event upsets (SEU), multiple-bit upsets (MBU), single event functional interrupts (SEFI), single-event transients (SET) and single event latchup (SEL). A SEL is where the formation of parasitic bipolar action in CMOS wells induces a low impedance path between power and ground, producing a high current condition. Therefore a SEL can cause latent and hard errors. Examples of soft errors would be bit-flips or changes in the state of memory cells or registers. A SET is a transient voltage pulse generated by a charge injected into the device from a high energy particle. These transient pulses can cause SEFIs. SEFIs are soft errors that cause the component to reset, lockup, or otherwise malfunction in a detectable way, but does not require power cycling of the device to restore operability. A SEFI is often associated with an upset in a control bit or register. JEDEC defines a hard error as an irreversible change in operation that is typically associated with permanent damage to one or more elements of a device or circuit (for example, gate oxide rupture, or destructive latch-up events). The error is hard because the data is lost, and the component or device no longer functions properly, even with a power reset. SEE hard errors are potentially destructive. Examples of hard errors are SEL, single event gate ruptures (SEGR), and single event burnout (SEB). SEE hard errors can destroy the device, drag down the bus voltage, or even damage the system power supply. In terms of the satellite payload, the instruments are becoming more complex. At one time, communication satellites were basically bent pipe, repeater architectures that would essentially relay signals. Today they are Multi-beam and have onboard processing (OBP) architectures. More complex electronics translate into greater risk from radiation effects. High volume small-satellite constellations are using more commercial grade plastic components. Commercial off the shelf (COTS) devices generally tend to be more sensitive to radiation effects. Also, with small-satellite there is less structural mass shielding the electronics. With finer IC geometries and thinner oxides, the sensitivity to TID radiation effects is reduced, and the TID tolerance is improved. On the other hand, SEEs increase with reduced IC scaling. Less energy is required to produce SET and SEU. With higher frequency devices, SETs can turn into more SEUs, increasing the number of SEFIs. Mitigation techniques used to address higher speed transient signals can be more challenging. The space products group leverages Analog Devices’ portfolio of devices in the support of the space industry. We have proprietary silicon-on-insulator (SOI) processes that provide radiation tolerance for space level applications. In some cases, we modify core silicon to enhance the radiation tolerance of devices. We also have the ability to port designs over to radiation hardened SOI processes. We integrate the die into hermetic ceramic packages and characterize the device over the extended military temperature range. We target the development and release of fully qualified, Class S QMLV products using the Defense Logistics Agency (DLA) MIL-PRF 38535 system for monolithic devices, and MIL-PRF -38534 for Class K Hybrid and multichip modules. For radiation inspection, we currently offer high dose rate (HDR) and low dose rate (LDR) tested models and for new product releases, we offer SEE test data. Analog Devices offers commercial, industrial and enhance products (EP) automotive, military, and space qualified devices. EP devices are designed to meet mission critical high reliability applications, primarily in the defense and aerospace market. Other product grades include military grade monolithic devices and multichip module QMLQ and QMLH devices, space qualified monolithic devices, and multichip modules designed under military specifications as QMLV and QMLK devices. Analog Devices also offers space qualified Class K die for customers who are developing hybrid or multichip module solutions. Class K qualified die are offered against standard aerospace datasheets and customer source control drawings. ADI offers EPs, plastic-encapsulated devices designed to meet mission critical requirements and high reliability applications. With customer input, we are initiating a new device product category for space applications that we have defined as enhanced products plus (EP+) devices. Our customers are requiring improvements in size, weight and power; higher performance; wider bandwidths; increased operational frequencies; payload flexibility and optimized reliability. Spacecraft designers are being pressed to use commercial devices in order to meet high levels of performance in increasingly smaller and lower power and lower cost spacecraft. The Internet in the sky is a good example. It is estimated that 60% of the world’s population does not have access to the Internet. To address this market, companies are planning to deploy large constellations of small, low cost satellites circling the Earth that will enable access to a worldwide communication network. Analog Devices is working with customers to define EP+ to address this evolving new market. EPs provide COTS solutions for high-reliability applications with no additional cost of custom upscreening. EPs are plastic-encapsulated devices released with a military temperature range of (-55 to +125) degrees C. In addition to requiring an extended temperature range, EP customers require devices to be lead-free and whisker-free. They require devices with a controlled manufacturing baseline, a standalone datasheet and an EP change notification process. These devices also have an associated V62 vendor item drawing under the Defense Logistics Agency documentation system. Currently released EPs are identified by a special EP suffix and have a separate standalone datasheet. As noted, Analog Devices is also developing a new device concept for space level applications, EP+, for low earth orbit systems and high altitude applications. We currently support EP+ products against source control drawings. ADI would like to offer a standard COTS grade device for space level applications. With the EP+ approach, we envision a device somewhere between standard EP devices and military 883-grade devices, providing COTS solutions for space level applications without additional cost of custom upscreening. With the EP+ approach, we can generate COTS devices, provide wafer lot traceability and lot specific radiation inspection data. 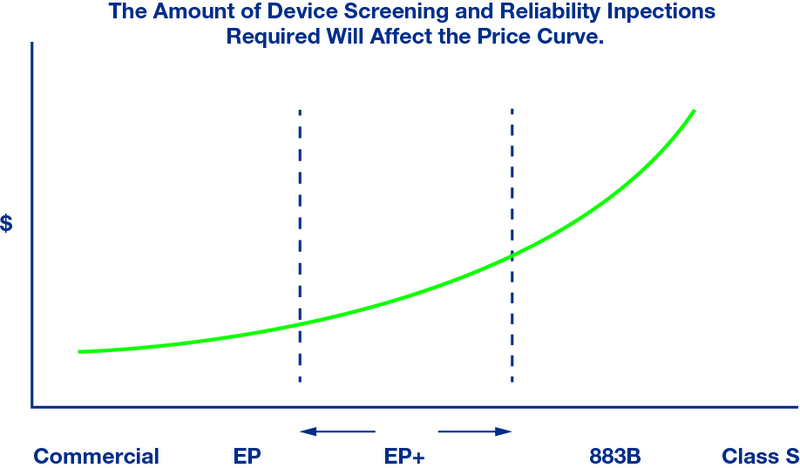 The key issue is determining the proper balance between reliability and cost as depicted in the curve in Figure 2. The more screening required, the higher the unit cost. In defining this new product category, the current challenge for the satellite industry and for Analog Devices is to define the optimum screening level vs. cost point for commercial devices used in space level applications. To summarize… Analog Devices’ goal is to deliver a complete product for space level applications and not just a component. Analog Devices currently offers over 90 standard generic space qualified devices, with greater than 350 models in different grades and packages. A few of the new featured space qualified products are the ADA4084-2S, ADA4610-2S and ADum7442S devices. The 5962R1324501VXA (ADA4084AF/QMLR) is a new low noise, low power space qualified precision amplifier offered as a QMLV space qualified device available against a SMD drawing. The device has 10 MHz unity gain bandwidth and rail-to-rail inputs and outputs. These amplifiers are excellent for single-supply applications requiring both AC and precision DC performance. The 5962R1420701VXA (ADA4610-2BF/QMLR) are space qualified dual channel precision, very low noise, low input bias current, wide bandwidth JFET devices. These amplifiers are especially suited for high impedance sensor amplification and precise current measurements. The ADUM7442R703F is a space qualified 25 MBPS, quad-channel digital isolator with three forward and one reverse channel. The devices offer bi-directional communications. The space qualified devices offer galvanic isolation, which means that the input and output circuits have no direct electrical connection. They offer advantages in size, weight, power and reliability over competing solutions. In this two part article series, we explored challenges engineers encounter in implementing circuits for space level applications. Analog Devices has been supporting the aerospace and defense markets for over 40 years with high reliability devices. Analog Devices has the depth and breadth of technologies that spans the complete signal chain including sensors, amplifiers, RF and microwave devices, ADCs, DACs, and output devices that provide solutions to the challenging requirements of the aerospace industry. With a dedicated aerospace team for product support and applications support, Analog Devices’ goal is to deliver a complete product solution for space level applications and not just a component. Chris Leonard is a member of the Analog Devices Space Products marketing team, focusing on electronic components for space level applications. Chris joined Analog Devices in 1982 and has supported the design, development, and manufacturing of electronic devices focused on military and space level applications. With over 30 years in the semiconductor industry, he has held a variety of engineering roles in multichip module design, assembly, test and qualification operations, in addition to several years experience in bipolar wafer process technology. He has spent the last 20 plus years in a variety of marketing roles, primarily focused on military and aerospace markets.